Equipmentland offers a wide selection of thumbs for extendahoes. Rigid, hydraulic, mechanical and even some models which connected to a bucket or coupler. Equipmentlnd features thumbs by Amulet, but we offer others when the need may demand a special treatment. Some thumbs are in stock and some are built to order. Browse our listing or call today to find out how we can help get you outfitted with the best thumb fitted to your backhoe or excavator of any size. A three-position mechanical thumb with its own main pin on a weld-on mounting plate. Stores out of the way when not needed. A full range of models available for excavators, mini-excavators and backhoes. Some models upgradeable to hydraulic. Also suitable for non-extendable sticks. An upgraded BRUT Thumb to hydraulic, has its own main pin, cylinder and weld-on base plate except some models utilize the main bucket pin. For extendahoes with cast iron sticks, some models are bolt-on. Models for use with nearly all buckets and quick couplers. Stores flat under the stick when not in use. For backhoes without auxiliary hydraulics, a diverter valve kit is available to utilize a lesser-used hydraulic circuit (i.e. stabilizer) to power your thumb. Also suitable for non-extendable sticks. HOECLAMP Full Motion Mechanical Thumb for Extendahoes – No Hydraulics Needed! Opening and closing your bucket also opens and closes the unique patented Hoeclamp. This full-range non-hydraulic thumb utilizes the main pin of your bucket and easy-to-install linkage. Installs in about an hour. For standard digging the thumb stores out of the way on the dipper stick. For many telescopic sticks such as Ford New Holland, Komatsu, and older John Deere and Case models. Cat 420D models in stock. Especially good on John Deere MD45CW-11, 310, 410, C&D models, D-Series Cats and Kabota L-35’s. Over 1100 specific models for backhoes, mini and full-size excavators up to 30,000 lbs. Also suitable for non-extendable sticks. Fully integrated hydraulic thumb attached to a custom bucket for any extendable OR regular stick. Made to order. Bucket capacity, width and features built to meet your need. Also can be ordered as a rake/thumb combo to serve as a grapple. Models also available for excavators and backhoes with non-extendable sticks. 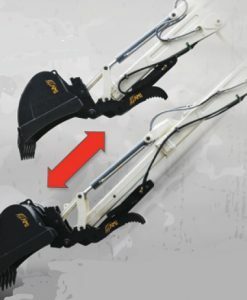 Add a hydraulic thumb to nearly any extendahoe with an inner extendable stick. – Add a Hydraulic Diverter Kit– Some measurements needed from forms we send you. – Diverter Kit w/ Rocker Switch. – A component only kit.